While these serve no performance function at this time, this was the best solution I could come up with for logging after market 5V sensors thru the stock ECU. If you guys like these, I’ll add more 5V scaling inputs thru secondary O2s (say you wanted to log fuel pressure or oil pressure). Right now, this is setup to log any 0-5V MAP sensor thru pin 92 98-99 Flash Ecus, pin 74 91-93 Flah Ecus, pin 74 94-97 Flash Ecus. Any 0-5V wideband thru pin 93 98-99 Flash Ecus, pin 55 91-93 Flah Ecus, pin 77 94-97 Flash Ecus. All you need to wire is the sensors 5V output signals into these pins, then scale them according to the manufacturer settings. After you have this setup, then all you need to do to log them is select MAP and wideband Scaled in EVOScan. If you have your scaling setup correctly, the values will be accurate. You should be able to find the scalings for any/all sensors in their supplied manual or thru google. The AEM Uego Wideband O2 scaling is 0V is 10 AFR and 5v is 20 AFR. 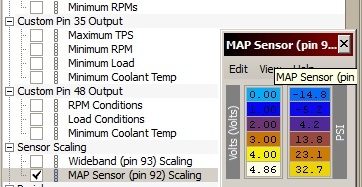 For another example, this is the scaling for the EVOX map sensor. ****I do not have a list of every sensor and their scalings however in the future I may compile a list for you guys. For now, you’ll have to do a little searching. I highly recommend you test your scaling and your evoscan readings of your sensors. You want to make sure you sensor is as accurate as possible because you are basing your tune on the accuracy of your sensor’s setup.